Carlos Sanchez is an excellent birder, a Miami resident, and a polyglot. Corey was lucky enough to meet Carlos while birding in Ecuador, where Carlos was dragooned into accompanying the horde of Queens birders for the day, an encounter that somehow didn’t turn him off of all things New York. If you have been out birding in southeast Florida there is a good chance that you have run into him in the field. Just keep an eye out for the Barred Owl perched on a Mini Cooper and that is where you will find him. We’re pleased to share this guest post by Carlos – hopefully it is the first of many of his posts to appear here on 10,000 Birds. After a very brief respite in June, Neotropical migrant passerines are on the move again throughout the state of Florida, and I find myself already getting ahead of myself – pining for winter birding in search of wood-warblers, vireos, orioles, and tanagers. That’s right. While most of the country will soon witness a mass exodus in terms of diversity and numbers of warblers, southeast Florida’s formerly empty suburban parks will soon be full of wintering passerines seeking food and shelter in the balmy, pseudo-tropical climate again. Over twenty species of wood-warbler may be recorded in a single winter in Miami-Dade County, with several more species recorded regularly in Monroe and Broward. During the winter, southeast Florida becomes the wood-warbler capital of the ABA area. With the northern Bahamas just to the east and Cuba just to the south, southeast Florida biogeographically sits on the northern edge of the Caribbean and so the wintering wood-warbler species are mostly those typically found further south in the islands. For example, a feeding flock in a small suburban hardwood hammock such as at A.D. Barnes Park will usually contain the following species in the month of January: Northern Parula, Black-throated Blue Warbler, Yellow-rumped Warbler, Prairie Warbler, Pine Warbler, Palm Warbler, Black-throated Green Warbler, Yellow-throated Warbler, Black-and-white Warbler, American Redstart, Orange-crowned Warbler, and Ovenbird. In addition to these widespread species, Common Yellowthroat and Northern Waterthrush are reliably seen in the right habitats. Other species such as Magnolia Warbler, Cape May Warbler, Yellow Warbler, Worm-eating Warbler, Wilson’s Warbler, Louisiana Waterthrush, and Yellow-breasted Chat are recorded annually in small numbers. As one can see, seeing twenty warblers in the winter in southeast Florida is well within the realm of possibility! Of course, for many local birders, part of the excitement in this hobby is finding the unusual or rarely recorded, and winter offers perhaps the greatest deal of excitement in this regard. 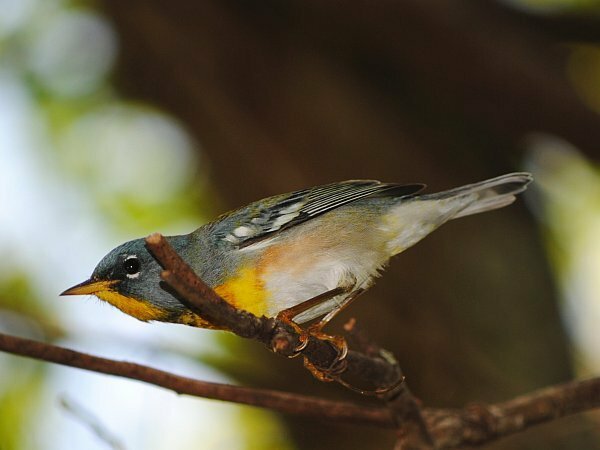 Rarities such as Blue-winged Warbler, Hooded Warbler, and Nashville Warbler have all been recorded multiple times, and these records raise a lot of questions as to which species spend the winter regularly in the comparatively underbirded Caribbean islands. 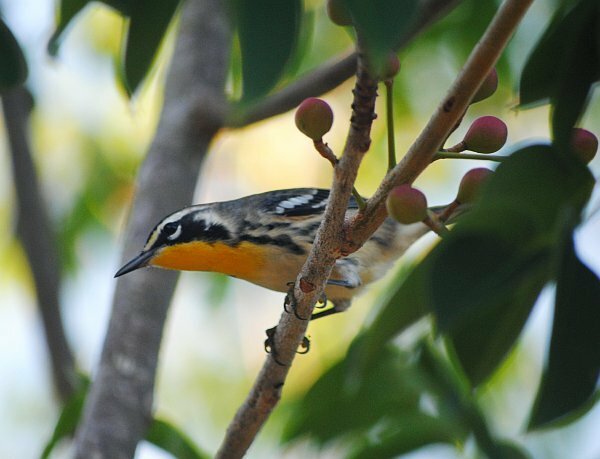 Western vagrants show up nearly annually in one form or another, with species in the last five years including Black-throated Gray Warbler (Green Cay Wetlands, Palm Beach County), Townsend’s Warbler (Bill Sadowski Park, Miami-Dade County), and MacGillivray’s Warbler (C-111 Canal, Miami-Dade County). What does this mean for the visitor? For those visiting from overseas, I believe that birding in South Florida in the winter is an excellent introduction to this fascinating and beautiful family without having to worry about timing your vacations around a particular week of spring migration or wondering if the weather will cooperate for maximum diversity or numbers. For those who live in the United States and have already seen many of these species, it offers a chance to see them behaving outside breeding and migratory periods. After all, a very significant portion of their lives are spent on their wintering grounds. As a birder, it gives me a very different experience and perspective on the lives of these birds. Instead of heralds of spring that fill the forests with song, I see them in tight, social feeding flocks that move through the evergreen broad leaved trees with quiet seeps and chirps in search of insects or jostle for food at a fruiting tree. 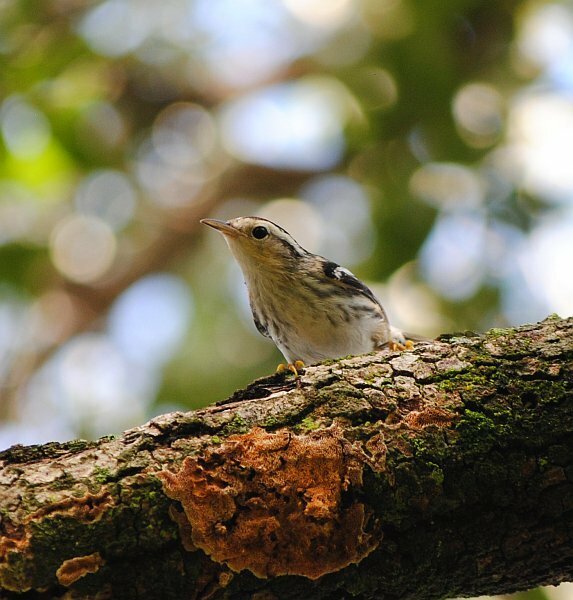 As fall migration picks up momentum, warblers will fill the suburban parks and natural areas of Southeast Florida for local and visiting birders alike to enjoy. Hi Carlos! That MacGillivray’s Warbler was a Life Bird for me, but I was very sorry I missed the Kirtland’s Warbler at Richardson Park. Of course, that was in Broward County and in October, so maybe it didn’t meet the parameters of your post. I hope you’ll be writing more about the birds of southern Florida, maybe the hawks that show up in the fall over the fields by Lucky Hammock? Lovely photos! There’s something special about yellow feathers on birds, isn’t there? Nice article… Being in Miami for 20 years, I agree totally. It is much more likely seeing a black-throated blue, redstart, and even summer tanager in Southeast Florida in the winter than an American robin, goldfinch, or many other ‘typical’ wintering species elsewhere in the ABA area. I may go as far as saying these neotropical migrants are more reliable in this region in winter than during the hit and miss spring migrations of late! I agree! I work as a kayaking guide in Big Cypress in the winter. The warblers in the mangrove tunnels make every day such a treasure hunt. Winter in Florida is a birder’s dream, especially when birding by boat! Hi Carlos, Love the article. I am thinking of coming to Florida in the next couple weeks and wandering where the best locations are for seeing wood warblers?